Allterra Environmental specializes in Geologic Hazard Investigations, Septic System Evaluation & Design, SWPPP Preparation, Environmental Site Assessments (Phase I and Phase II), Remediation/Cleanup (Phase III), and Monitoring Projects. Our services are related to Environmental Planning, Regional Water Quality Control Board, and County Health Department regulation. Learn how we can help with a Free Project Assessment. Allterra has 14 years experience performing consulting geology services in the Central Coast region; a Geologist who received his MS and BS in Geology from UC Santa Cruz, and we are approved by Santa Cruz, Monterey, Santa Clara, San Mateo and San Benito County for Geologic Hazard Investigation consulting. We understand local geology and local agencies. Environmental regulations can make simple tasks complex. From small solvent plumes to constructing new homes on rural property; we put ourselves in your shoes and understand how communication, hard work, and professional expertise are fundamental to the Customer Experience when dealing with Environmental Regulation. Allterra is a certified Small Business in California (DGS#1568700). Our Environmental Team lives and works in the Central Coast; our project expenses and payrolls are reinvested in the Central Coast, and our knowledge and work experience is focused on the Central Coast. Experience the refreshing feeling of hiring a great small business that cares about your project. We provide Comprehensive Geologic Hazard Investigations, Waste Discharge Site Evaluations, Septic System Evaluation & Design and Groundwater Management planning to support development of rural property in Santa Cruz, Santa Clara, Monterey, and San Benito Counties. We provide Environmental Site Assessments (ESA Phase I & Phase II), Annual Storm Water Monitoring & Reporting, Corrective Action, and other Monitoring and Data collection services (SWPPP preparation) to support compliance with Regional Water Quality Control Board, County Health, or Department of Toxic Substance requirements. 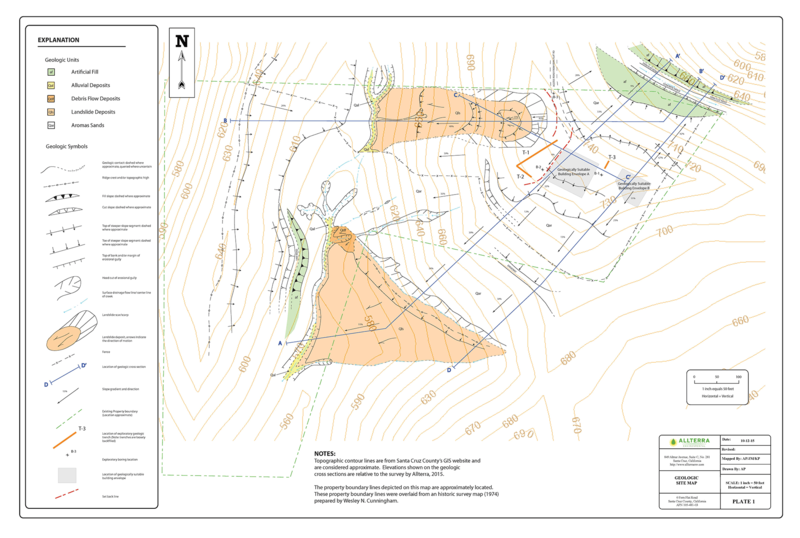 Allterra evaluated Geologic Hazards affecting a proposed residential construction project on Fern Flat Road in Aptos, an area known for strong seismic shaking and slope instability. Allterra’s comprehensive Geologic Hazard Investigation evaluated seismic shaking, ridge top shattering, co-seismic ground cracking, erosion, and land sliding to define safe buildable areas of the parcel where Planning Department will approve construction. We completed file reviews at the Planning Department, field reconnaissance, geologic mapping, exploratory trenching, and interview of County Geologist and Planning professionals to provide recommendations for development of the property. 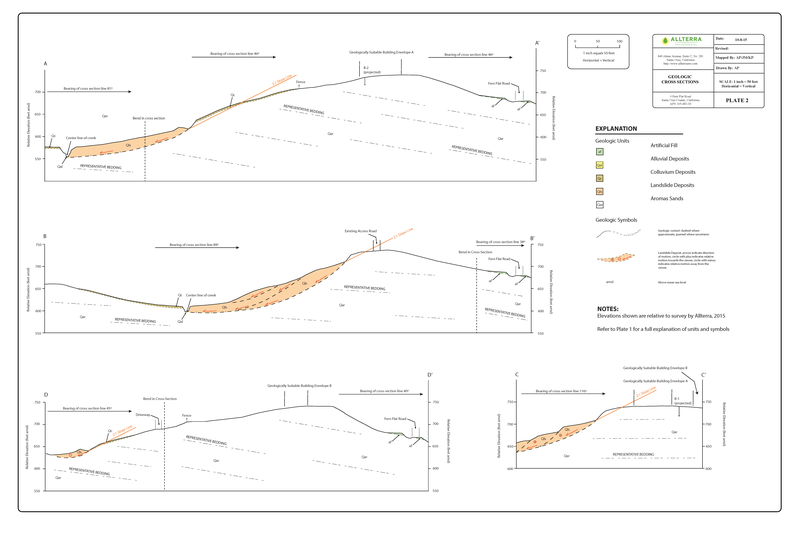 Setback and mitigation of Geologic Hazards. 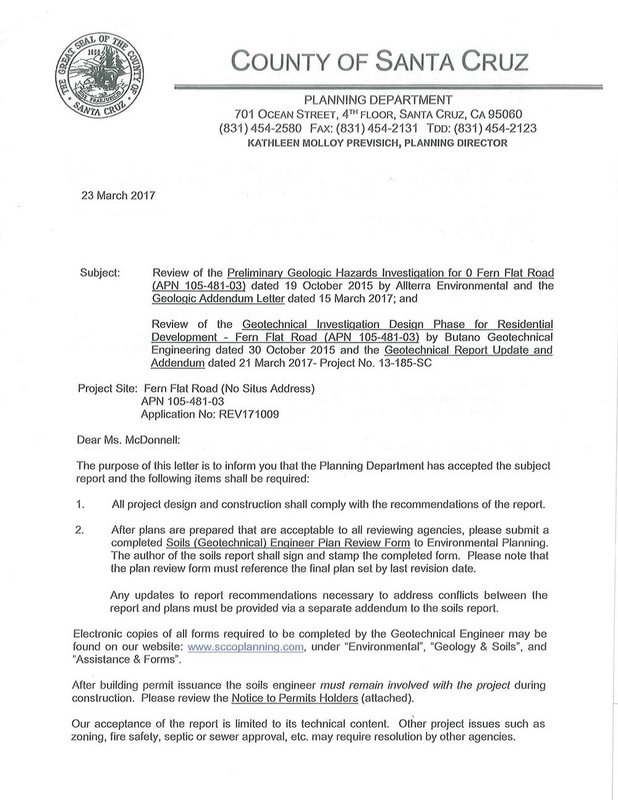 Fern Flat Geologic Hazard Investigation resulted in approval by the County to proceed with site construction. Ready For a Free Project Assessment? Want to discuss your options or get a second opinion? Talk to us today.